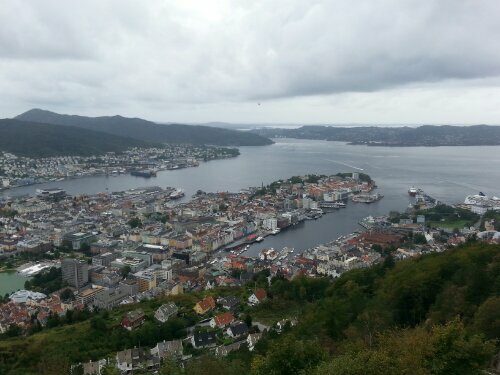 Rain greets us as we arrive in Bergen, Norway. The Captain said it would rain all day. Accuweather said it would let up as the day progressed. Accuweather was right! 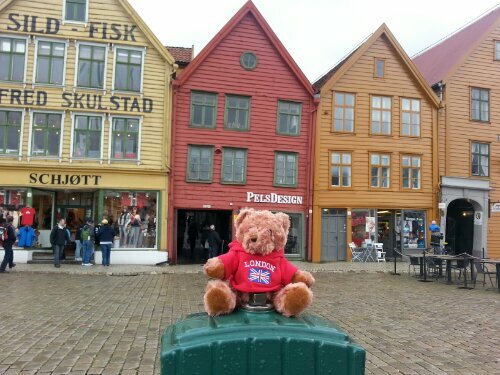 We braved driving rain and wind and made our way to Bryggen. We had purchased Ho Ho bus tickets, but with the weather, the buses were full. Within 10 minutes, the rain and wind had let up. We gladly tucked the umbrellas away! Bryggen (the old harbor) is as pretty as advertised…and expensive. My fridge magnet was roughly $12. Yikes! We walked over to the fish market and saw live langostinos (a first for me) and cooked lobsters going for about $40 each! I must say “Yikes” again! After a couple of hours walking around, we headed back to the ship for lunch. We were not going to pay $20 for fish and chips! The moment we were back in our stateroom, the Heaven’s let loose anothet torrent of rain. Excellent timing on our part. We opted for a quick meal in the buffet before settling in to read for a bit. DH was keeping an eye on the top of Mount Floyen. We wanted to take the funicular to the top, but the mountain had been shrouded in clouds. A bit before three o’clock it cleared and off we went. Although still overcast, we had a great view of the harbor. Despite the less than stellar weather, we really enjoyed this first stop in Norway.